Hopefully, I’ll have good news soon! I have added a ton of new art creations and some more vintage finds to my Etsy Store…So, check it out soon, please. Oh, and I bought new lights and have a new set-up for taking pictures of my work. You can tell by the Borders, and that the pictures are watermarked. Hopefully, this will give you a better perspective on what you are considering purchasing and give you a better look at color and the overall design. If you have questions, please ask. Let me know you stopped by, I would appreciate it. Also, I decided to only run my crafts at Amazon for now. You can find my wreaths there. When I find some time (ha,ha) I will try to load some of my other crafts. Newest Listings at my store for everyone to look at and purchase. Newest Listings November 2015. Everyone Likes A Sale, Right??? Looking to start your Holiday Shopping a little early??? Stop by my shop. Adding new stuff every day, plus lots of Vintage to look through. PRE-HOLIDAY SALE…. Oct.30th until Nov. 15th get 20% off a minimum order of $50 plus receive Free US Shipping. Dilema. Amazon Hand Made or Etsy, Which will work better? I hope you’re all having a wonderful Sunday. Have you started shopping yet? I’ve heard from some that are already half way done with their Christmas shopping..can you believe it. I wish I was half way done, but in honesty, I haven’t even started. I’ve been working on more jewelry, and have started listing some of my items on Amazon Handmade now too, in addition to Etsy. I don’t have a lot listed on Amazon yet..its still really new and I’m just not sure how I feel about it yet. I’m comfortable with Etsy and sometimes stepping outside of my comfort zone is difficult for me. Also, Amazon is strictly hand made only, and they won’t allow any of my Vintage jewelry Finds that I have for sale. But, they allow anything hand made, so I have listed some of my wreaths and I will be adding some of my other crafts over time. So if your looking for something special and hand made, whether its for you or as a gift, don’t forget to check my listings on Amazon now too: http://www.amazon.com/handmade/SLG-JewelryCrafts If I don’t receive results, the jewelry will be moved back to Etsy, but for now, I’m giving it a try. 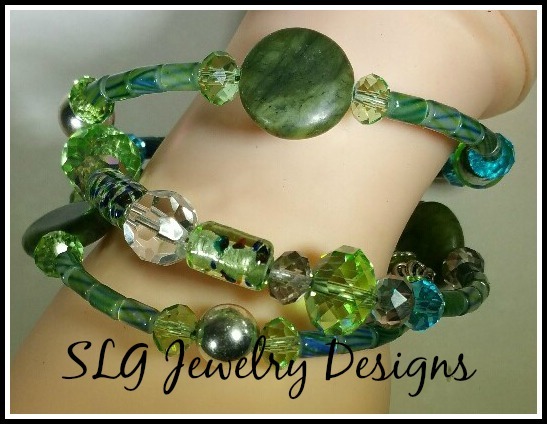 I am Shari Gardner, and this is my blog for SLG Jewelry Designs. The cat pictured, is Jinxy the mascot, that likes to help me by stealing anything shiny that she can get her paws on (I’m sure there is a whole ton of bling under my bed) or she spends her day trying steal my chair while I’m working and because she is so spoiled, there are days I sit on a small stool, while she relaxes in my comfy seat. What can I say, you have to be a cat lover to understand. For most of you that read my posts regularly, you most likely already know this, but if you’re new to reading my blog, then I want you to know that I buy majority of my supplies for making jewelry from B’Sue’s Boutique. Not only does she have the best quality for all supplies, including her brass stampings in which she is well known for, but for every other product that she sells, each has been personally tested by B’sue and she only sells what works, which for me, saves money since I don’t have to spend my time doing comparisons. For this Challenge, all participants had the pick of 4 different raw brass items (shown above) that B’sue sells. We could buy as many of these 4 as we wished, and we were being challenged to take at least one of the pieces and “change it up,” in other words to not make what we would normally do with that particular piece. As you can see from the picture below, I choose the large flat brass cuff bracelet. I ac tually used 2 of the same cuff bracelets and I cut them apart and managed to make 1 much narrower cuff bracelet, 1 Necklace, 1 Brooch with a Bail attached to allow it to be worn as anot her necklace if c hosen by the buyer, and is able to be layered with the original first Necklace, and lastly, out of the remaining pieces I was able to make a pair of earrings to match. So, I managed in total to achieve 4 pieces (5 if you count each earring separately) of jewelry out of 2 of the flat cuffs. From this picture you can tell that I chose to torch the pieces for a darker multi colored patina. But, for me, I didn’t like the color, so I ended up using Lumiere Acrylic Paints. As I continued working on the original pieces, I couldn’t help from being extremely picky and changed out items that had already been attached and added new items in those places. So you’ll be able to tell there is a big difference in the final results from the side pictures. Also, in addition for some fun and to help make this a cohesive line of jewelry for my Etsy store (https://www.etsy.com/shop/SLGJewelryDesigns?ref=hdr_shop_menu), I used some other B’sue stampings and made another cuff bracelet, 2 rings, and a hair band, that all match perfectly with the finishes I applied to the original pieces. Therefore, instead of only 4/5 pieces to sell in my store, I added another 4, and will be able to add to this line very easily if I choose to make more. In thi s picture, you can see how I attached a pin back and a bail, so the Brooch Pin is also a necklace and can be layered with other necklaces if the buyer chooses, especially since that is one of the new trends that will be occurring for fall and winter 2015. I swapped out some of the purple hearts that I was planning to use, but decided they were too childish and didn’t go well with the rest of the ensemble. I kept all of the ceramic roses and every piece has at least one of the following: A butterfly, a heart, leaves, and the color teal either in a rhinestone, or cabachon, which is on the list for Fall Fashions. In the pictures below, you will see all of my finished pieces. I hope you’ve enjoyed looking at my work and that you’ll consider stopping in at my Etsy store sometime. Now that the blog hop is going, I will be checking out all of the other participants work and reading their blogs, then I have a huge amount of vintage jewelry that I still need to finish going through and get it all ready to be for sale under the vintage section of my store. I’m guessing I will be adding these new pieces gradually over the entire weekend, so if your interested in the vintage stuff, keep checking out my store for new listings. Well, the Blog Hop for B’Sues Boutiques Creative Group is getting closer every day…September 25th, to be exact. Speaking of getting back on track, I’m getting a little nervous about the blog hop, since as of this moment I don’t believe I have enough items completed for sale in my store. I’m working on it and trying to do things faster, but in order to make sure I sell a quality product, I can only go so fast. But, I will get done what I can, and if there is something you want that isn’t there, you know I’m always happy to create a custom order just for you. I have been doing a lot of work to my store too. Changing listing titles and fixing old mistakes, typos, etc. so you can find what you want faster too. Afterall, I know your time is valuable too and I don’t want you to have to spend a half hour looking for a pair of earrings. So now I have the basic headings: Necklaces, Earrings, Bracelets, Rings and Vintage. But, I kept some of the themes: Animals–includes cats, dogs, horses, more. Beach–is anything ocean or beach related such as shells, octupus, lizards, starfish, more. There’s Butterfly and Birds, Hearts and Flowers, and lastly Fairy and tales, which includes all different kind of Fairies and other pieces that are a bit odd or coincides with a cartoon, or movie. I had Alice in Wonderland Earrings, but I just sold them to one of my close friends. I may have to make another pair. Anyhow, if you can’t find what your looking for under the traditional headings, check the theme headings, you may find something completely unexpected that you like. I just won another auction for some more Vintage jewelry too, so hopefully it will get here quickly, so I’ll have time to get some, if not all, of it listed for the Blog Hop event too. I always do as much research as I can on each piece of vintage jewelry I find. If its signed by the maker, then I will clean it up and do repairs if necessary. If its unsigned, I clean it up too and do as much research as I can in hopes to figure out who made it. I also have a couple of outstanding women in B’Sues Creative Group that I can talk to and show pictures and with their experience they can sometimes tell who made it, or at least give me a ball park of when it was made. I always sell unsigned pieces at a reasonable rate if they are in good condition and hopefully the buyer will be willing to share their knowledge of who made it and why they bought it, so I can learn for future pieces. Otherwise, even if the pieces are old, if I only have one earring, or the piece is broken and unrepairable I will salvage what I can and those parts go into new pieces that I make. I never throw anything away. If it can be repurposed into something new, then I will, so hopefully even just that little bit of history lives on. To me, every piece of jewelry has a story and even the brand new stuff will be purchased and worn by someone and hopefully be taken care of, so it can be passed down through their family creating a piece of history all on its own. If you’ve ever considered making jewelry and selling what you make, there is a lot to learn before you jump in with both feet. I know it seems easy; go to your local big box craft store, pick up some beads and string, or even a kit, that comes with a few cheaply made tools and some findings (ear wires, clasps, head pins, eye pins, etc. ), and then open up a website and the money will just start rolling in. However, as much as I wish that were a reality, running any kind of business, big or small is not that easy. I’m not an expert and I don’t pretend to be. I do know a lot about marketing, since before I got sick (that’s a whole other blog) I was only a couple of credits away from having my MBA in Marketing. Regardless, you don’t need a college degree to start your own business; you just need to know the right answers. First and foremost is making quality jewelry that customers will buy; this means knowing your market, i.e. who is going to buy it? Women, Men, Teens, etc. and making items you hope those people will like, at the prices you’ll need to charge to make a profit. Also, it requires skills you may have or maybe you don’t. Whether it’s just to brush up on what you already know or you want to learn something completely new, you can take paid classes through your local community college or sometimes a city has night classes, or you can take paid classes online, and there are tons and tons of videos on YouTube for free. You can choose to watch any videos you like, but my favorite is B’Sues Boutique https://www.youtube.com/watch?v=z-y8T1C7cZE. Brenda Sue, the owner of B’Sues Boutique http://www.bsueboutiques.com/default.asp is also my favorite supplier for quality brass stampings and vintage inspired stampings that I use in almost all of my jewelry. I’m sorry if I sound biased, I am, because I believe she has the best supplies and prices, and NO I am not being paid for this post. I have tried many other supply companies, until I found her on the Internet. She also has a closed group on Facebook called, B’Sues Boutique Creative Group, (https://www.facebook.com/groups/bsueboutiquescreativegroup/ which has some of the absolute, nicest people you could ever meet and its free to join, as long as you make mixed media/metal jewelry. Don’t let the “Closed” portion scare you, it just means you have to send Brenda Sue a request and she will let you join (there are over 3500 members). Once you’re involved, there are monthly and weekly motivational challenges to help you reach completion of your designs. You’ll be “in the know” for anything related to the jewelry world well before anyone else. You’ll learn so much and not just from Brenda Sue, but she has a design team that will help you and answer questions if she isn’t available, and other group members will chime in with their opinions too. The group is filled with people just starting out, people somewhere in the middle, and some extremely experienced artists that have very sucessful businesses. A few are also very experienced in vintage jewelry, so when you get lucky enough to find one and know nothing, they can help fill in the blanks, as long as you post pictures of the front and back. There are Pinterest Boards for the group, so your items can get extra advertising. If your piece is well made it might even make it into B’Sue’s Newsletter or onto her Blog. The best part I like is it is completely “drama free.” It is ALL about jewelry and you’ll make some great friends too. Second, have the right tools and supplies. Jewelry tools are specific for making jewelry and designed not to scratch up the metal your working on, or break after only making a few things. Quality needs to be considered, and even if you don’t have medical issues, the good tools, although a little more expensive will last longer and are ergonomically made to save wear and tear on your precious fingers, hands, and wrists. You’ll also need the correct supplies for your craft. Are you going to be doing a lot of beading? Then you’ll need to know the correct kind of stitches and knots, the size of beads you need for each individual project. Or, maybe you want to work with metals and a torch, then you’ll need to know the proper safety guides, as well as having a good base knowledge of what types of metals are available. Although every metalsmith would love to start with sterling silver and 14k gold, the costs of learning on these metals are usually out of reach for someone just starting out. Also, if your working with any kind of metal, you’ll need the right tool for that job. Some wire cutters, as an example, are only meant to cut a certain thickness and if you try to use them on something too thick, you’ll break the tool. As for supplies, this includes everything from beads (plastic, glass, Swarovski crystals, German glass, Czech, and more), Stampings, Charms, Wire, and Bases to build with that come in all thicknesses and metals, such as Brass, Copper, Silverplated, Sterling Silver, Gold plated, Gold Filled, and more. Plus it all varies in thickness such as 8 gauge, 14 guage or 24 gauge, the higher the number, the softer the metal, which also then still comes many ways, like soft, dead soft, half hard and so on. There are also other materials that can be used to make jewelry, including leather, resin, polymer clay, and even one of the oldest forms, cold porcelain. Each has its own set of tools required and just about everything I have listed in this post can be colorized with different types of inks, paints, or dyes. So, now that I have filled your head with all of the possibilities, you’ll still need somewhere to sell your items and you have lots of options there too: Etsy, eBay, Shopify, Handmade Amazon (this is brand new), craft shows, and more. You’ll need a good camera, so you can get the clearest pictures possible without using a flash. Most of today’s newest cell phones have pretty good cameras that can do the job, but if your still carrying one of those old flip phones, you’ll need to upgrade, plus you will need access to a computer for listing your items online. Lastly, you’ll also need packaging materials, mailing materials if not selling locally, business cards, and as many advertising opportunities that you can come up with and can afford, such as the Blog Hop that B’Sue’s is having on September 25th, a Facebook page for your business, a Blog, Pinterest, Twitter, Instagram, if you have money to start out with your own website, and you could do paid advertising on FaceBook, Google, Yahoo, and more. Some print or electronic magazines are reasonably priced too. The more you can get your name out there and network, the more opportunities you’ll have for people to see your work and hopefully buy it. Considering the amount of information I have given you to think about, I’m going to stop at this point and I’ll give you some more information in my next post. Maybe between now and then you’ll have decided to join me and the rest of the artists at B’Sue’s Creative Group. Or if you have questions, let me know. Have a wonderful, artistic time until we meet again. P.S. Don’t forget to stop by my Etsy Store to see if I have anything you like. I am still working hard on getting as much stuff made as I can for the B’Sue Boutiques Blog Hop Sept. 25th and the upcoming Holiday season. It seems crazy to be thinking about holiday gifts, since its still only August., but it takes time to make each piece. So, you have to get a jump on it, so you don’t miss out on any sales, because you didn’t have enough for your customers to buy. I’ve been a little down the last couple of days, not sure why, my store has only been open a couple of weeks, so maybe I’m asking too much of myself, or it could be partly because I’ve been running a low grade fever for the past couple of days…no other symptoms though, so I’m still working. My daughter, Rebecca, has bronchitis again, so I hope I’m not starting to get that. Anyhow,had a long talk over the phone with one of my new friends and I feel a lot better. Going to really be concentrating on taking good, clear, well lighted pictures of my items for sale. And, I am going to delve into that scary world called Instagram. I haven’t done it yet, but besides my facebook page, my store, and this bog, it is something I should be doing. If you haven’t stopped in at my FB page or my store, please do. You might even see something you want to buy for that special someone. Upcoming Event that I am participating in!! Just a quick update here today. I have been working really hard taking new pictures of old listings I had in Rebecca’s store and trying to get them back up and listed for sale in my Etsy store. For some things its easy, since they are either vintage pieces or things I made that I love….for others though, I’m finding I’m knit picking. The knit picked pieces are either being updated, remade completely, so I don’t just list an “ehh” piece, but an “ahh” piece I want you to love as much as I do. I know I’m my own worst critic, but I refuse to sell pieces I don’t like, regardless the reason. I’m just hoping you will love the stuff I make. So, back to work for me.. I have earrings, bracelets, and rings coming soon. Have a wonderful weekend. MY very first Blog on this Site!!! 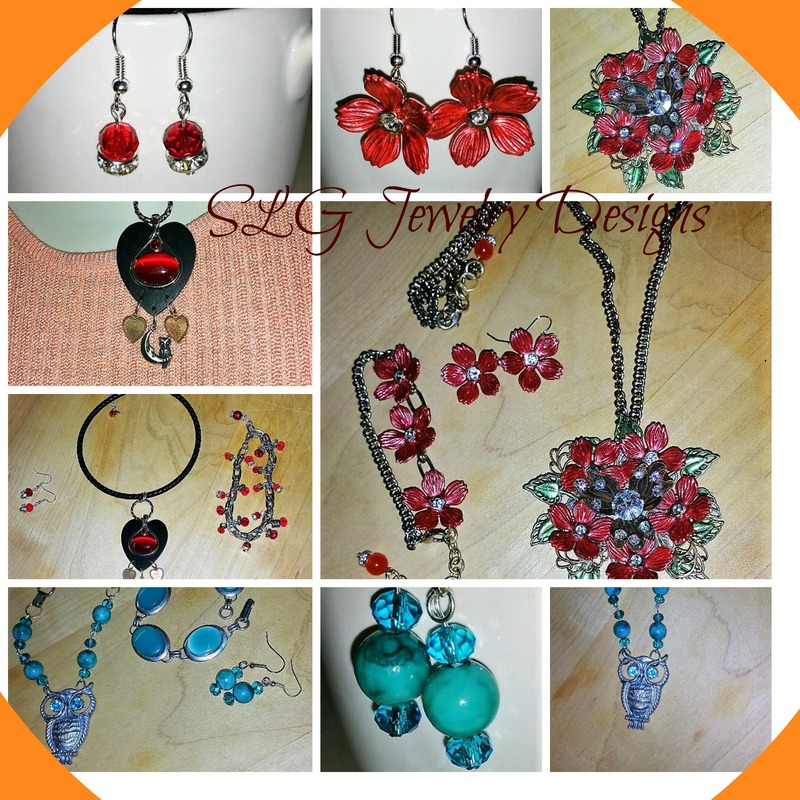 This is my first blog for this site (SLG Jewelry Designs—in case you forgot where you are or got lost..LOL). You may have read my other blogs, but I can assure you, this blog is here to be upbeat, funny at times (I hope), and to either inspire you to pursue your own entrepreneurial dream, or to inspire you to help me with mine and convince you to buy something I’ve designed. This whole blog is basically a shameless plug to see if I can find more customers (I’m not going to lie to you). But, who knows you may learn something too. You will be able to follow me, as I am trying to get my “hobby”,as my hysband likes to call it, off the ground and turn this into an actual business. There will be little blogs when I will tell you something that my cat or dog did that I find particularly funny. One example, my cat,Jinxy, likes to steel shiney pieces, so if I can’t find something,I usually check her hiding spots first. Currently, I make all different types of jewelry (which you can see in the gallery, but please check the store to see if its still available. If its sold,no worries,just let me know which item you like and I should be able to make you something similar–please note I make all one of a kind items, so nothing will be exactly the same, but I’ll try to get close). Anyways, I do traditional beading, wire wrapping, assemblage/collages, metal work, Ice Resin, and I have recently started playing with Polymer Clay. I work mainly with brass, copper, and silverplated items,because the cost of supplies for sterling silver and gold are just so high and depending on the piece,its not really necessary. I do run across some very nice vintage pieces and if they are intact, I clean them up to sell, but if they’re broken and unsigned, then I take them a part and repurpose them. Some of the most beautiful stones or beads are from long ago and I hate to see them not be seen. Although I do buy from other suppliers occassionally, B’Sue’s Boutique (http://www.bsueboutiques.com/default.asp)has the absolute BEST prices, brass and silverware stampings, and an amazing group on FaceBook where all jewelry artists come together to share ideas and learn from each other, as well as Brenda Sue. She has tons of tutorials on YouTube I highly recommend if your learning. Well, that’s it for today. I hope you’ll come back.